A inspirational, heart-warming book about four girls trying to find their place in the world. Siobhan Curham celebrates very different but like-minded friends in this captivating novel. Amber craves excitement and adventure. Instead, she’s being bullied at school for having two dads, and life at home isn’t much better. 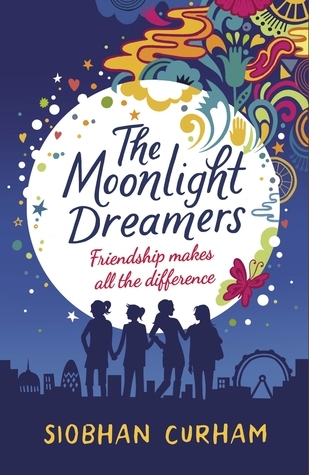 Inspired by Oscar Wilde, Amber realizes that among the millions of people in London, there must be others who feel the same as she does; other dreamers – moonlight dreamers. After chance encounters with Maali, Sky and Rose, Amber soon recruits the three girls to the Moonlight Dreamers. It’s high time they started pursuing their dreams, and how better than with the support of friends? I was really excited when this book arrived as I always enjoy Siobhan Curham's books and I didn't even know this was on the horizon. I loved this book for several reasons. I loved the girl relationships within this book. Don't get me wrong they aren't perfect especially between the step sisters in the book but it is nice to see a book where the teenage girls support each other and are actually nice to each other rather than the bitchy back stabbing which often gets portrayed. I loved the diversity in this book. The characters are all from very different backgrounds some of which I haven't seen portrayed in YA before and it was nice to see stereotypes challenged and representation of these sort of girls out there because in every case the girls are so well done.